When we lived in our old how, the answer was, I don’t. I worked with what already existed, worked around the issues as they came up, planted lots of things people gave us for free, and kind of just dug. And re-dug. I didn’t know what I was doing, didn’t know what I really liked, and kind of was never inspired to keep it up too well. It was SUCH a source of guilt when I wasn’t doing yardwork, and SUCH a painful chore when I was. Aren’t there people who like this crap? I would think that all the time. Our new house has even more space to work with and it was weed-and-spider infested. There wasn’t much worth salvaging so we didn’t salvage anything. Cuz it’s fully fenced, has a nice deck and is nice and large, you could say it’s got good bone structure. 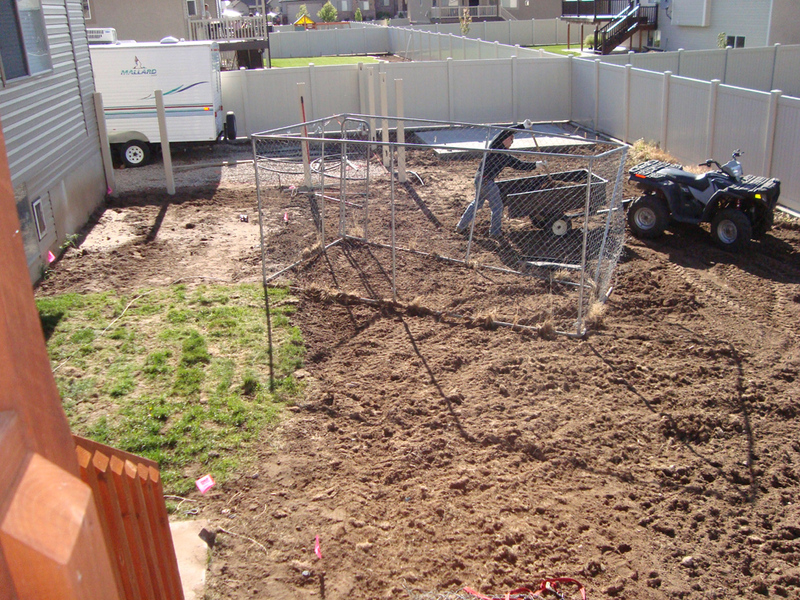 My husband has already abolished the weeds on the left side of the house and laid down gravel for an RV parking space, poured a cement pad for a shed in the future, tilled/leveled the entire yard, put in rain gutters and yard drains, put in sprinklers, and had gates put in on the sides to contain our doggy. In related news, he’s already lost 8lbs on his already-skinny frame. We are seeding this week which means in 6 weeks we should have some grass growing! Then the fun starts for me, but this time around I’m going to have to plan better. 1. Determine our must-haves. That is – patio under the deck, shed, fire-pit area, room for badminton and other yard games, shade, veggie garden. Yard should be relatively low-maintenance and nice for entertaining. Probably a good thing to consider early-on is a budget as well, but I’m not going to bother because we are doing it all ourselves, as we can. If we can only get 2 trees per year, so be it! 😉 I don’t expect to have a perfect yard in 3 years, but rather keep working on it in phases and enjoy the process because that’s what fits our budget both time and money wise. 3. Figure out what “style” or “look” I’m going for. After lots of pinning (here), I’ve pegged my style as rather cottage-y, maybe even a little folk-arty. 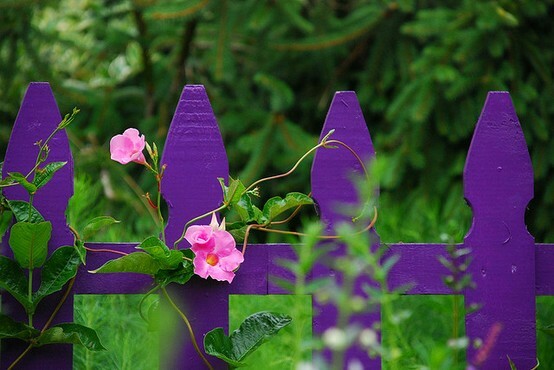 That is – wildflowers, sitting areas, fences made from found-objects… those are the things that appeal to me. Nothing overly manicured/neat but not over-crowded. I also really like COLOR! 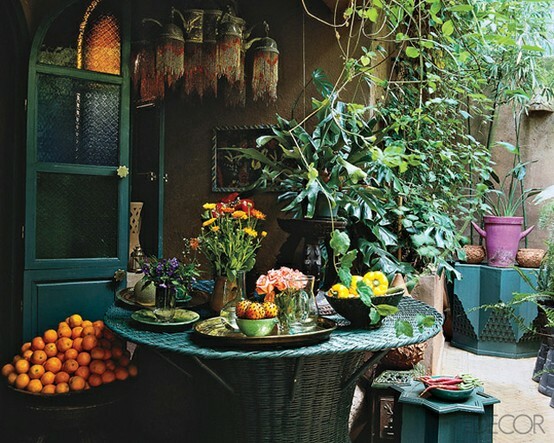 Painted wood mixed in and bright flower patches and bright pots. Fun! 4. Research! I prefer talking to people over reading books, but I’ve been doing both. I am asking co-workers and neighbors for suggestions, not to mention relying on my green-thumb parents for advice and ideas. What trees/shrubs to plant and where to get the best deal, namely. Also looking at lots of books and mags and blogs. 5. Document. I bought a pretty book to hold ideas, lists, sketches, tags from trees I buy, list of what I’m planting and where (for future reference- I now know I WILL forget, literally within weeks). –This was a genius suggestion from my boss and I think I will get a second book for indoor home details – paint colors, window measurements, etc. How about you? Does anyone have any yard-planning tips to share with us rookies? 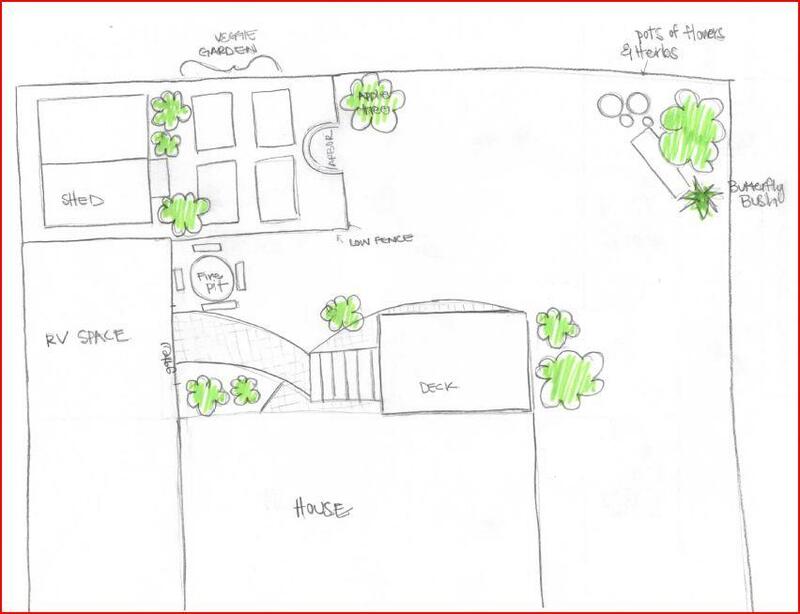 What are your yard projects and plans (now and future)?